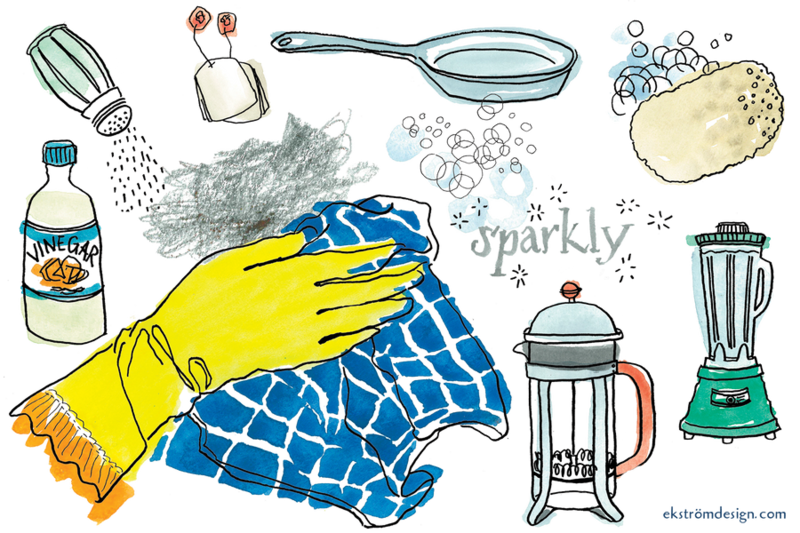 Stained coffee pots, pans covered in gunk, and cooked food caked on the bottom of the oven—every kitchen has its dirty secrets. Now you can come clean with these tips for getting rid of the most stubborn stains and persistent kitchen problems. Fill the pan with 1 part white vinegar to 3 parts water. Bring to a boil and let cool, before washing and drying as usual. Here’s a tip: Don’t use a sponge. Trying to unclog dried food from your zester will leave you with a pile of sponge zest and an even dirtier zester. Soaking your dirty zester in hot, soapy water will loosen any dried-on food and make it easy to rinse clean. The coffee scum that coats your French press isn’t just ugly, it’s also affecting the taste of your morning brew. Scrub the mesh filter with a brush and fill the pot with hot water, baking soda, and vinegar. Push the filter down into the pot and let stand for about five minutes. Pull the filter out, dump the baking soda and vinegar solution in the sink, and wash the pot with hot water and soap. The trick to keeping any food from sticking to the oven floor is to clean it while the oven is hot. Dump salt on the food and wipe clean once the oven has cooled. Put about a cup of white vinegar in the reserve chamber and fill the rest with water. Run the brew cycle, letting the vinegar and water drip into the carafe. (We’re looking at you, Turmeric Tonic). Fill the machine halfway full with very hot water. Add ½ cup white vinegar and a few tablespoons of baking soda. Cover and hold a thick towel over the lid. Turn the machine on and let blend for about 30 seconds. Dump the solution, rinse, and dry. There’s probably a box of baking soda in the back of your fridge that's been there for a very long time. Go ahead and dump the baking soda down your sink and start tossing used tea bags into an open bowl or container at the back of your refrigerator. They absorb odors as effectively as baking soda does while giving your tea bags a second life. If hard water in your dishwasher leaves your drinking glasses cloudy, run a load with white vinegar instead of detergent.